Rocking the Boat. 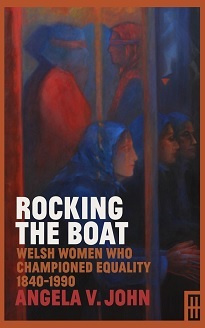 Welsh Women who Championed Equality, 1840-1990 is a collection of essays that focuses on seven Welsh women who, in a range of imaginative ways, resisted the status quo in Wales, England and beyond during the nineteenth and twentieth centuries. They challenge expectations about how women’s lives were lived then. They also explore different approaches to biographical writing and understanding as well as raising issues of gender and nationality. From the pioneer doctor and campaigner for progressive causes Frances Hoggan, to the irrepressible twentieth-century novelist Menna Gallie, these women spoke out for what they believed in, and sometimes they paid the price. They became familiar, and often, controversial voices on the page and platform in London, Oxford, Northern Ireland and internationally. Lady Rhondda and Edith Picton-Turbervill championed women’s equality at the heart of power in Westminster whilst Myfanwy and Olwen Rhŷs saw education as the key to change. Women’s Suffrage played a prominent part in the lives of these women and was especially important to Margaret Wynne Nevinson. Their intelligence, determination and grit is revealed through their stirring stories. Taken together these essays critically investigate the challenges, setbacks and hard-won achievements of feisty women who rocked the boat over 150 years.